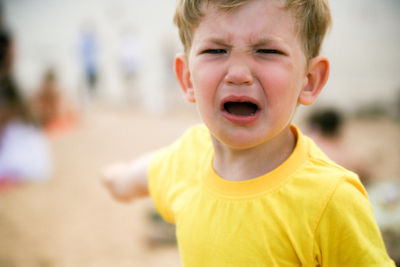 The recently published study "The characteristics of temper outbursts in Prader-Willi syndrome," sheds light on temper outbursts in Prader-Willi syndrome. This is a common challenge for many people with PWS. Drs. Rice, Einfeld and Woodcock, all very experienced researchers in the area of PWS, set out to develop a more comprehensive understanding of the characteristics of temper outbursts in PWS. In this study they explored the age of onset, frequency, duration and the types of situations that appeared to lead to a temper outburst. The researchers also questioned whether aspects such as age, gender, genetic subtype and onset of hyperphagia may affect temper outbursts. A better understanding of these components will lead to more fine-tuned interventions for these behavior challenges in PWS. As part of the study, Rice and her colleagues developed a PWS temper outburst survey based on information collected from semi-structured interviews with 22 PWS families. Parents were asked to rate the frequency, intensity and duration of temper outbursts that occurred over the past month. Participants for the interviews and for the final survey study were recruited from the Australian and other international PWS associations. In order to be in the study the person with PWS had to display at least 1 outburst per month. An outburst for this study was defined as “becoming very angry or upset in a way that seemed excessive for the situation and beyond the person’s control." A total of 101 primary caregivers for people with PWS (PWS age range 1–64 yrs.) completed the final survey. Mean age for the person with PWS for whom the caregivers were providing care was 16.14 years (SD=10.94). Interestingly, in this study, no differences were found in temper outburst across gender or genetic subtype, suggesting that if the high level of outbursts in people with PWS is due to a genetic aspect, this genetic issue is likely present in both subtypes. 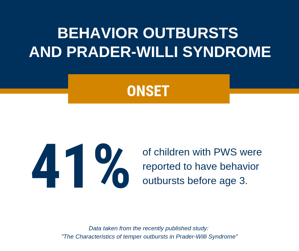 Overall the findings suggest that the start of temper outbursts in PWS occurs a bit later than what is reported in the typical population. Previous literature has found that in typically developing children, 91% display outbursts by the age of 3 yrs. Only 41% of children with PWS were reported, in this survey, to be displaying outbursts by the age of 3. In terms of frequency of outbursts parents reported the following Means for each PWS age group: Children = 2-3x/week; Adolescents = approx. 2x/week and Adults = 1x/week or less. There was a statistical difference between the frequency scores for Children vs. Adults, with the adults having fewer outbursts. However, Rice et al., (2018) also found that the duration of the outbursts appeared longer in adolescents and adults (range 10 to 30 mins) as compared to the children (range 0 to 15 mins). These themes are being used to help guide the development of more effective management strategies for temper outbursts in PWS. This study revealed that the most effective behavioral approaches to outbursts were to give the person with PWS the space to calm down (take the person away from the situation or the situation away from the person) and/or providing a distraction to get their mind off the issue. Having a behavior management plan for the person with PWS was deemed "somewhat effective" but other approaches such as family therapy or anger management program were not rated as effective for reducing temper outbursts in the person with PWS. Parenting programs were reported to be "somewhat effective" but very few families had tried this type of program. A small number of individuals (N=4) were reported to be prescribed medication to use acutely during a tantrum. Varying effectiveness for this treatment was reported by caregivers (e.g., Valium rated as not effective while Lorazepam & Quetiapine were rated as effective). This may reflect the difference between a longer vs. shorter acting sedatives. Thirty two (32) people with PWS in this sample were prescribed daily medication for aggression and temper outbursts. The most commonly prescribed daily medications were Risperidone and SSRIs (antidepressants). These medications were rated as “somewhat effective." An important question unique to the PWS population the investigators were interested in exploring was, does hyperphagia correspond with the onset of outbursts? This is difficult to determine but given the results of the present study and those of a 2001 study by Dimitropoulos, et al., it appears that temper outbursts may start before the onset of hyperphagia. However, it has been suggested that these two phenomena may still be linked in some way. The physiological mechanisms for hyperphagia are likely in play before caregivers may notice changes in eating behaviors, e.g., change in weight often occurs before strong hyperphagic behaviors. Thus, while outbursts may not be triggered by hyperphagia the mechanism driving these two behaviors may be interrelated in some way. In summary, temper outbursts are common in PWS and tend to be an ongoing issue for people with PWS and their caregivers across the lifespan. Although some medications may be helpful for decreasing tantrums the reports of effectiveness appear to be modest. However this study did highlight some behavioral areas that could be fruitful for the development of specific interventions for temper outbursts. Caregivers reported that having space away from the stimulation or trigger and distraction from the issue are strategies that can help the person with PWS calm down. These strategies may highlight an underlying challenge in PWS related to emotion /self regulation. Previous studies (such as this one by Roben, et al. and this one by Samson, et al.) have shown that emotion and self regulation skills predict outbursts and aggression in typically developing children and in people with autism. Lauren Schwartz Roth, Ph.D., received a B.A. from University of California, San Diego and a Ph.D. in Clinical Psychology from the University of California, San Diego/San Diego State Joint Doctoral Program. She did her clinical internship and research postdoctoral studies at the University of Washington, Department of Psychiatry and Behavioral Sciences and Department of Rehabilitation Medicine studying the the impact of chronic illness and disability on patient well being with an emphasis on the physical and emotional impact on of living with and caring for someone with chronic illness/disability on families. She is a Clinical Associate Professor at the University of Washington, Department of Rehabilitation Medicine and also works as a research consultant for several outside organizations. Lauren is one of the early members of FPWR and served as Vice President and then President of the FPWR’s Board of Directors from 2004 to 2010. She remained on the Board of Directors until 2016. Lauren has also served on the FPWR's Scientific Advisory Board since 2009. She and her husband Mark have two beautiful daughters, including a 19 year old daughter with PWS.